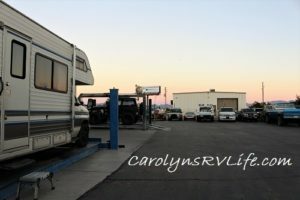 I'm a Full-time RV Snowbird in Arizona and Nevada! It’s almost February and I’ve been on the road for ten months. When I try to create a timeline of the places I’ve been and the things I’ve seen over the last ten months, it’s but a blur. It’s true, the older I get, the faster time seems to go by. I fondly remember the slow, lazy days of summer, exploring southern and eastern Oregon. Wintertime living in an RV is different; the days are short, the nights cold and I am spending much less time outdoors. Sure, some of that is because I’ve been consumed with work, but also, there are just fewer hours of daylight to take advantage of! 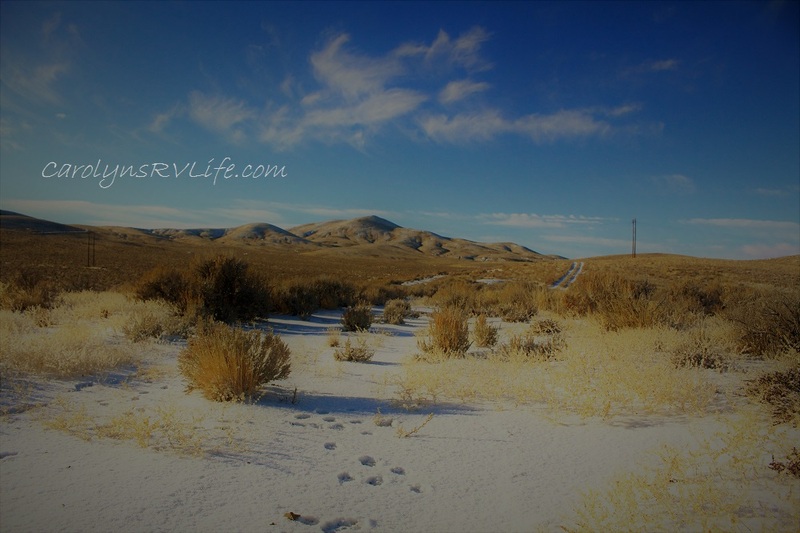 Since spending Thanksgiving in Medford with my good friend Bob and his family, I’ve frolicked in snowfall, high in the Nevada desert (and shot a video about it that went viral! ), woke up to a twenty-five degree rig in the outskirts of Carson City (where it was about 15 degrees outside), survived RV-rocking 45 mile per hour wind gusts near a ghost town in Goffs, CA (video), explored Joshua Tree National Park (video) where I gazed wondrously at the mysterious twisty-trees and ambled through the rocky desert of southern Arizona (video). My trek from Oregon to Arizona was adventure-filled, that’s for sure! I was excited to spend the winter in the desert- my first season as a genuine Snowbird! A couple of years ago, on my way back from a backpacking trip in Capital Reef National Park in Utah, I stopped for the night in Mojave National Preserve. I was tired from my long drive and pulled off on Zzyzx road (yes, that’s a real road) into the desert to sleep in my car. I awoke to a mauve-tinted sandy landscape alive with sun-glow creosote and crisp, layered hills of the high-desert mountains in the distance. I pulled my backpacking stove out of my pack, boiled hot water and made my morning coffee. I sipped it’s smooth, robust warmth into me as I leisurely drifted over the barren land. As the coffee pushed away the morning fog, my soul became electrified with adventure and freedom. As I devoured the serenity of my surroundings, I made a promise I would go back and backpack it someday. Last year, determined to keep my promise to myself, I drove the eight hours to Mojave Preserve for a three-day backpacking trip. It turns out ninety-degrees in the desert is far different from ninety degrees in the mountains. By 11 am, after hiking five miles, carrying 16lbs of water (a 3-day supply, or so I thought) plus 15lbs of gear, I had to stop, set up my tent for shade and lie as still as possible. I think I nearly got heatstroke! I literally could not move a muscle until the sun went down. The next morning, I was up and packed before sunrise, hell-bent on getting back to the safety of my car before it got too hot. I hiked five miles in less than two hours and was back in my car luxuriating in my powerful AC by 8 am. I had gone through all two gallons of water in 24 hours! Despite my less-than-fun backpacking experience, I couldn’t wait to get back to the desert- this time with plenty of water and my home behind me. So, I in my new RV life, as a winter snow bird, I headed south, in early December. My first stop in the “real” desert (low and warm!) was on some BLM Land (Bureau of Land Management) in Pahrump, Nevada. I found an idyllic spot, high upon a mountain, amid creosote, Cholla and Joshua trees overlooking the city. I had almost complete solitude the four or five days I was there, save for a few dune-buggiers (yes, I believe I just made up a word). My camp wasn’t far from the edge of a wide and deep wash that lent for gorgeous walks each day (video). The weather was mild, with days in the sixties and nights in the forties. I enjoyed my stay there immensely, but it was time to move on. I had plans to meet a group of fellow nomads in Arizona, for Christmas and a few places to see along the way. From Pahrump I went into Las Vegas to do some banking and stock up at Whole Foods. I found a wonderful dry lakebed just south of Vegas to boondock for a couple of nights before heading to my next destination: Joshua Tree. In 1996, my BFF and I took a 10,000-mile road trip zig-zagging our way from Berkeley to New York and back. We were young, adventurous – and poor. I’d been working my way through college as a waitress at Goat Hill Pizza in the Potrero Hill neighborhood of San Francisco, where Kristi and I met. One night at our favorite dive bar, after downing a few shots of tequila to wash away the crazy-busy night of serving pizza to Potrero Hill hipsters, we hatched a plan to drive cross country together once I graduated from Berkeley in May. For months, we stashed tip money into a locked piggy bank to save for our grand adventure. My little 1981 bright yellow Toyota Corolla was reliable, so all we needed was gas money, food and a tent. Nine months later, we were in Joshua Tree National Park; the first stop of our cross-country adventure! I’d never been to the desert and I was struck with awe; the smooth reddish rocks, the weird deformed-looking cactus-trees and the quiet serenity of the lumpy landscape. It left a lasting impression on me. For decades, I dreamed of going back. Twenty years later, a week before Christmas, Matilda carried Capone and me back into the park that held such fond memories. It was cloudy, gloomy and crowded. Nothing like the barren and secluded place, I remembered. Nevertheless, it was perfect! I drove the windy roads in renewed awe at what our planet offers a hungry adventurer. I wanted to park my RV, grab my backpack and immerse myself in its beauty. But Capone isn’t allowed on trails in National Parks, so I had to be content driving through, stopping at crowded scenic points and making short jaunts into the scenes before me. After carefully exploring and maneuvering Matilda through a couple of cramped and narrow campgrounds and finding nothing suitable for giant Matilda, I pulled into Belle Campground around 4pm and got the last site; which happened to be just big enough to squeeze into. The next day, tired of the crowds and the rules and restrictions of a National Park, I exited on the long and desolate Pinto Basin Road toward Cottonwood. I wasn’t exactly sure where I was heading, but thought I’d explore some BLM dispersed camping near the south entrance to the park. Just as I passed the Cottonwood entry sign, I spotted a sandy road that led to the West, speckled with Fifth Wheels, Motorhomes and Vans: boondockers galore! Yay! Home! I pulled in, found a level spot within eyesight of four RVs and called it a day. I could see and hear Interstate 10 from my site, but it wasn’t too bad. I ended up staying a few nights. 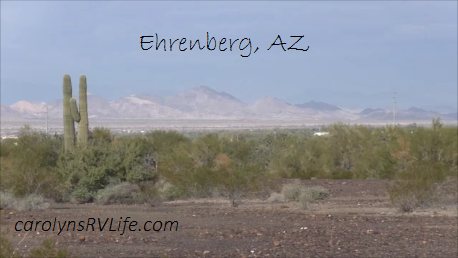 Next, I drove due east to Ehrenberg, AZ, where I met up with my friend Bob and fellow full time RVers and VanDwellers for Christmas. The camp off the East Frontage Road in Ehrenberg was a disappointment: rocky and barren, with obvious signs of heavy use and not much greenery – just overall bland. I stayed for Christmas (video), enjoying community and a low-key Christmas day potluck and then moved to the Colorado River for a few days. The river was low and down the bank from camp I had a sandy beach all to myself. My camp was framed by desert trees and brush, which shield me from the other boondockers along the river road; back to peace and solitude! For the past month, I’ve been exploring Arizona, with a quick trip into Los Algodones Mexico for migraine medication (video). 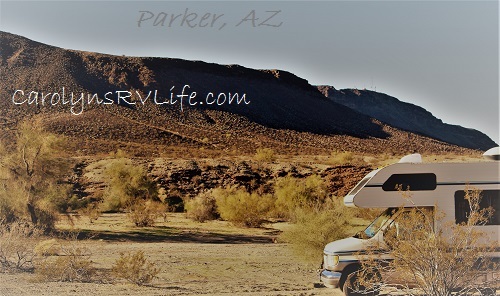 I’ve spent time in Yuma (where I experienced more RV trouble, videos here), Kofa Wildlife Refuge, Parker and Quartzsite where I attended the CheapRVLiving.com Rubber Tramp Rendezvous (RTR) and met so many wonderful people (video of our meet and greet). I have plans to explore southern Arizona and California over the next month or so, before it’ll be time to head north or to higher ground when the temperatures get to hot here. I will have lots of fun and adventure to share and will do my best to keep blogging about it. 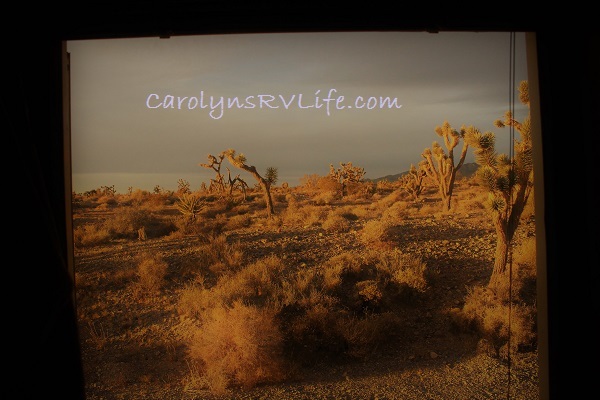 Share: I’m a Full-time RV Snowbird in Arizona and Nevada! It’s an awesome spot!! Loved it there! Just caught up on your blog. So proud of your accomplishments. You remind me of my daughters. I’m the 74 yr old widow from La Quinta CA who was so moved and inspired by your words that all I can say is, “I did it!” Went out on my first boondocking trip alone to the RTR. I had my moments of fear planning the trip but I sucked it up and did it. I’m not a full timer (still have two granddaughters living with me) So glad I stopped overthinking the idea and went. Loved it Met a gentleman who came to see my new class C rig on open house Sunday. We hit it off and are now communicating regularly. Possibly meeting up on a road trip. He has not retired yet but was also inspired by the RTR. BTW my new “forever piece of candy”is not my first Class C or RV experience. Her name is The Flying Pig. You know, “we’ll get on the road when pigs fly!” LOL Question for you: What kind of camera do you use for filming your vlogs and was it very expensive? 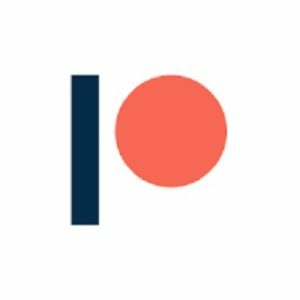 Would like to film my adventures for my family. My daughters and grandaughters are as adventurous as I am and their G-Ma would like to inspire them to stay brave and true to themselves. My oldest daughter, who just turned 50 and her daughter just did the Women’s March in LA. So proud! That gives you some idea of the genes I have passed on. Look forward to reading about you and Capones future adventures. Congrats on facing your fears and going to the RTR alone! WOW. huge accomplishment. I am proud of YOU! I wish I could have made it to a march.. found out about them too late (I avoid news as much as possible these days. :-(. “WOW”, you really did it! Truly am so appreciative of all you taught us about rving,we are becoming rver snowbirds next year. Just love your son,capone! Thank you Bonnie! Maybe I’ll see you out here next year! Good luck. I love reading your blog and watching your YouTube videos. You are living the life I want. I will be out there in a few years have to get the kids through school. The desert is so beautiful and cleansing for the soul. Be safe out there I’ll be waiting for your next blog or video. Roll on. I love your blog and videos. Keep them coming. 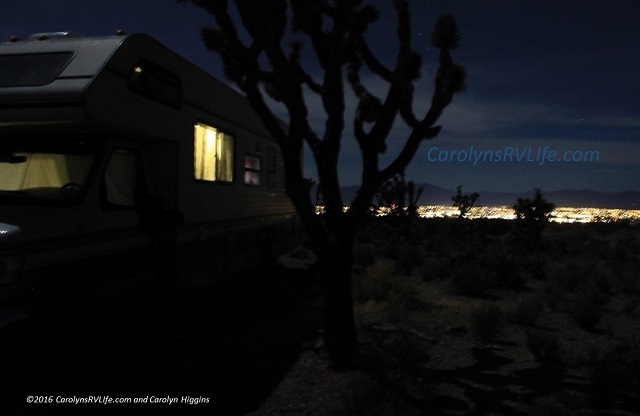 My husband, our dog, Lola, and I are full-time RVs with a home base in Pahrump, NV. This summer we’ll be campground managers on the Oregon coast north of Florence. Sending pets to Capone. 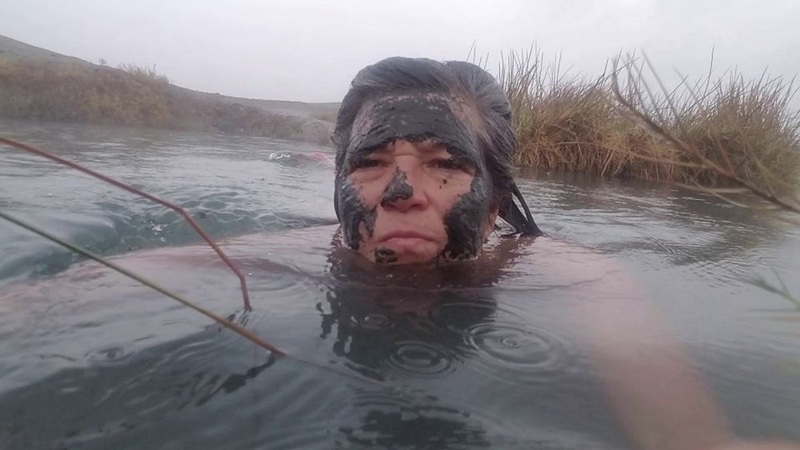 Thank you Jennifer, you have picked some great places to spend time! Have a great time!! woof! Whew! What a summary of your journeys! I often wonder how one can juggle YouTubing AND blogging. I will have to figure that out myself, especially as I hear that folks need to do both quite frequently. It’s just impossible as a solopreneur, from what I can see to do both equally. Your spelling for Los Algodones is absolutely adorable, Carolyn! BWM(before we met via clogs). I did read your blog about the adventures of the JMT and rear was poetry to my ears. I was sad when it ended. I know many hav told you that you are a marvelous writer and I’m here to tell you that it is indeed true. As if your plate wasn’t full enough trying to accommodate to your adventure please put “WRITE BOOK” somewhere on your to do list. It would be a smash hit……well, I would buy it and I know there are a lot of dreamers like myself out there. I spent last night dreaming about living in a nice trailer park in Fla.
and inviting you to park Tilly in my driveway for some time in the winter. I am presently involved in a personal injury law suit which is beginning to gain momentum. It is anybody’s guess what the final outcome will be but if it is resolved in my favor and that is very likely to happen I know I am considering hitting the road. My major concern is my age,72, but a very good 72. Have little or no knowledge about cars and other things mechanical and I’m not very strong. My Boston Terrier would be my sidekick. I guess the only thing I can do is wait and see how this legal issue pans out because that will be a major deciding factor. goodness of the human race as a whole but in men in particular. now (arm in sling but no cast for one vlog only). Campsite a pig sty in many vlogs and he was alone, no girlfriend/wife. He spoke of parting ways with Bob and was angry with the deal that was struck about posting older vlogs that they apparently had done “together”. Sounded like sour grapes to me and that Bob did a wise thing in the end. My impression of Jaime was all glory no guts and very good at getting himself into messes that he couldn’t get out of without calling in the cavalry or crying poor. I better shut up because I could be way off base but I don’t really think so. Bob seems like a gem and very genuine. I hope he is getting treatment for his heart issue? Afib can be very easily controlled with rather inexpensive medication. Please don’t print this as it could ruffle a few feathers, si? Thanks for your comments, I had been wondering some things myself, your perceptions seem accurate. I had been considering volunteering my mechanical skills but now I’m convinced I’m better to do it without an organized group. Good luck in your efforts towards a travelling life. Living vicariously through your adventures and learning so much. Thank you for sharing so much with us. I will see you in about a year. Happy trails to you and Capone. Carolyn, awesome adventures! We loved the guy who finally got your trans and “suicide brakes” straightened out. I had to call my wife in to see the signage on his fence….I just doubled over thinking a Berkeley girl ended up there! Hey, but he turned out to be a sweetheart. Plus, a lot of us hippy, cowboy, loner types end up driving big rigs so I knew exactly where you were…in the belly of the industrial beast. You make great videos that are really a lot about life (ups and downs) and healing…you just happen to be driving around in an RV. Safe travels! Bill, thank you very much for your kind message! Yes, I’m glad it all worked out finally too!!! 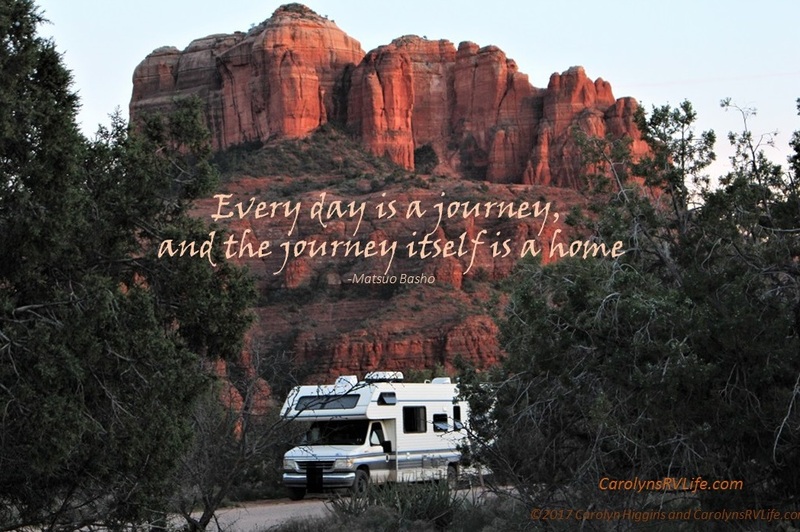 And yes, I’ve said my blog and my videos are as much about life as they are RVing.. It’s all part of the journey!!!! <3 thank you for understanding! 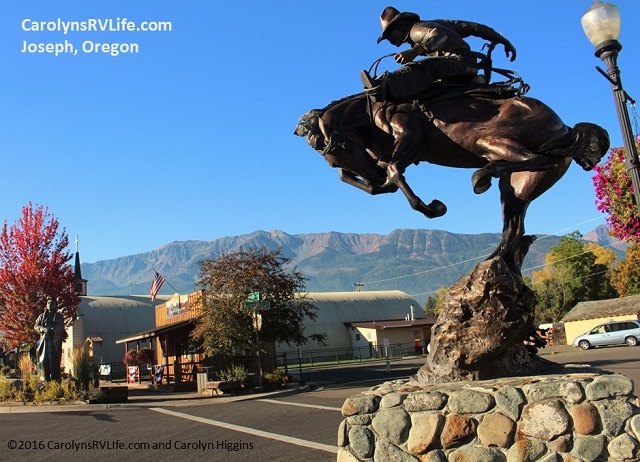 Carolyn, I plan on becoming a full time rver within the next year. I’ll be 64,,,,just me and my cat. Can’t wait! And I thank you so very much for all your videos and blogs with the tons of info in them. I know this will all help me when I make the big move to be a gypsy! Love your blog! If you make it to the Cochise Stronghold in Pearce AZ, let me know. I would love to hike up it with you! Carolyn — come to write about Florence AZ. We have excellent local mechanics as well as affordable winter rentals, sparking pools, golf courses, camp-RV resorts, churches, rodeos and roping camps. Lots of snowbird food and entertainment deals. Arizona home of Country thunder. I can offer housing to a typist this winter. North of Tucson. Just wanted to tell you that I’ve often said we are no better than indentured servants to the wealthy! You talked on one of your you tube videos about “I bought into women needing make-up, buying more to keep America employed/working, and so on.”. I’ve been saying these things forever. It’s true we no longer go to debtor’s prison. However, with interest rates being 25 – 30%, it will take a lifetime to pay off even a small amount of debt. No wonder the bible damns usury fees!!! I’m not terribly religous, but the good Lord 2000 years ago hit that nail on the head! Have enjoyed many of your videos. Husband and I just purchased a travel trailer and will use much of the info. He careful of the web haters and please keep posting!